‎ You can keep General the Cat from Cat's Eye. Church the Cat from Pet Semetary is a pretender to the throne. 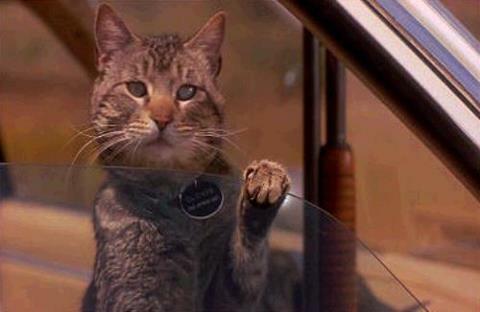 The greatest horror cat of all time is, was, and always will be Sparks the Cat as Clovis from Sleepwalkers. From his humble beginnings in the pound to the superstardom that accompanied his award worthy performance in Sleepwalkers, Sparks was the epitome of the rags to riches Hollywood success story. Working only for spoonfuls of baby food and a pure love of the craft, Sparks first came to prominence as Lucky on t.v. 's Alf. Although he was only one of five cats that played the role during the four year run of the show, Sparks' professionalism and laid back demeanor guaranteed that he was always the lead Lucky. He parlayed this success to noteworthy turns in both Purina and Fresh Step commercials before his triumph on the big screen as Clovis, surely the pinnacle of his awe-inspiring career. Thanks to www.horrorcats.blogspot.com for the Clovis hero shot accompanying this post.